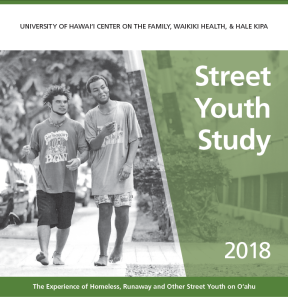 The featured content for March is the 2018 Street Youth Study, which looks at homeless, runaway, and other street youth on Oahu. Homelessness among youth is a serious and complex problem, with research showing that youth aged 12–17 are at higher risk than adults of becoming homeless. Transition-aged youth between 18 and 24 years are one of the fastest growing homeless populations. Homeless youth often do not receive adequate services. They may not meet shelter admission policies and, at times, there is a lack of bed space for youth. Although homeless young adults can use shelter services, services may not always be a good fit for the needs of this transitioning population. Learn more from the 2018 Street Youth Study on Hawaii Health Matters.